I have a really fun project to share with you today, and I hope you're going to like it as much as I do! I have recently acquired a few Lawn Fawn goodies, and so every now and again I try to participate in the LawnFawnatics challenge. 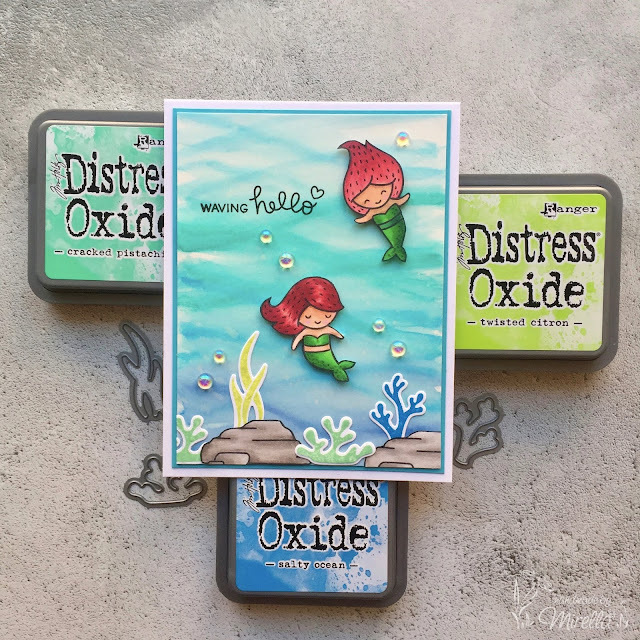 Entering challenges really motivates me to make cards - it's great to see how other crafters interpret the theme (fab source of inspiration! ), it helps when my mojo is hiding somewhere, AND if one is lucky - one can also win a prize from time to time - what's not to love, right?! This time, Lawn Fawn provided a mood board as inspiration. The second I saw the beach/sea theme AND the watermelon, I knew exactly what I wanted to make. Have you heard of "melonising" before? It's a super fun initiative that Pepita Hasenkeks (@pepitahasenkeks) came up with on Instagram a while ago. 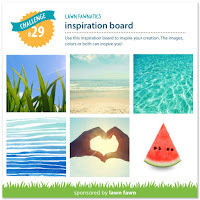 Basically, she wants people to turn any images into watermelons, with the use of colouring. Sounds mad? Well, check out #melonentierchen on Instagram, and your mind will be blown with people's creativity! I once turned Lawn Fawn's mermaid into a melon, and so I decided the time has come to use her on a card - this mood board was simply perfect for her! 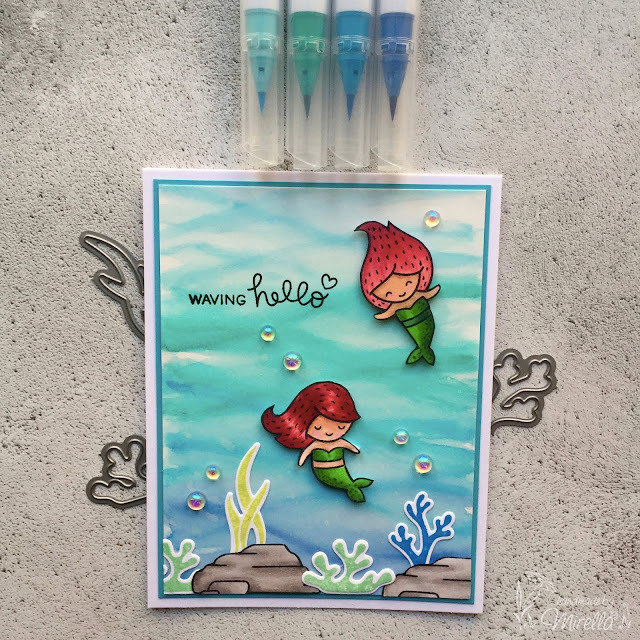 I created a sea background with ZIGs (Light Blue 036, Turquoise Green 042, Cobalt Blue 031 and Cornflour Blue 037) and some Perfect Pearls, stamped some corals with Distress Oxide Inks, and added a few rocks, coloured with Copics. I then decided to "melonise" another mermaid from the Mermaid For You stamp set - it truly made me giggle. As a final touch, I couldn't help but add a few of the gorgeous Iridescent Bubbles by Studio Katia - don't they look fab? I am really pleased with how this card turned out. It's not often that my end result turns out better than the design I imagined, so big YAY! How sweet with those mermaids. Your background look awesome! Mirella, this is so cute! 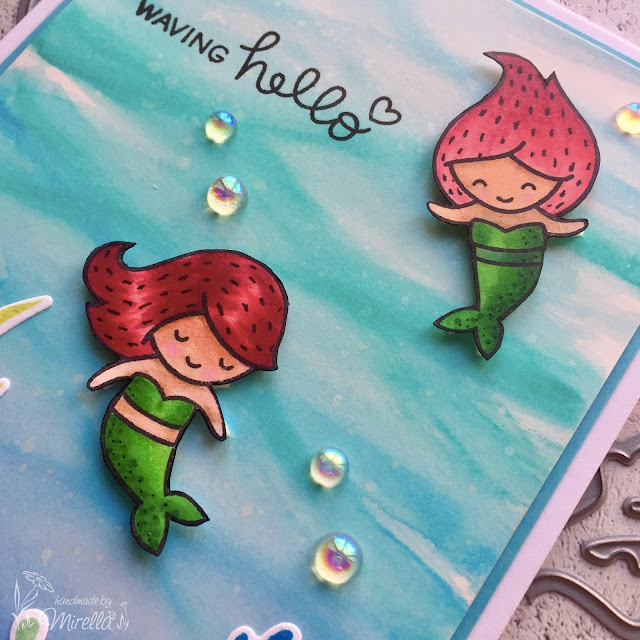 How fun to use the watermelon theme on the mermaids! I love it! Your card is fantastic. Thanks so much for playing with us at Lawn Fawnatics! Love your background and the mermaids are so cute!